Find and solve performance problems without adding costs. 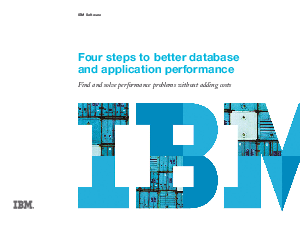 IBM InfoSphere Optim puts performance management in the spotlight! Optim solutions are designed to deploy quickly and easily out of the box for immediate benefit. Business-value assessment services are also available to help you design a custom solution - complete with full financial analysis. Either way, you can realize immediate ROI interms of cost and performance if you keep performance-management best practices in mind.